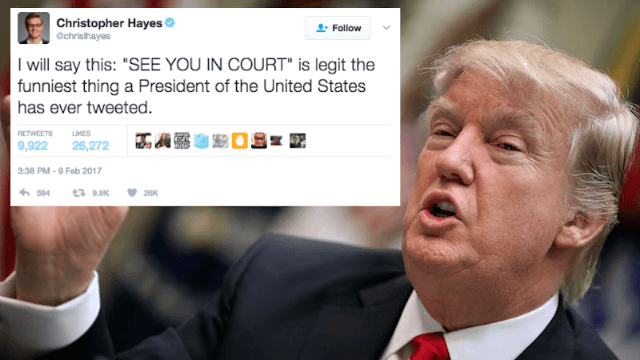 Here are Twitter's funniest responses to Trump's insane 'SEE YOU IN COURT!' tweet. See you in court? Didn't you just leave court? And aren't you saying that to the people who are also perpetually in court, as they are judges? The ban was lifted on Friday after federal judge James Robart in Washington State issued a decision that would temporarily block it, and the three judges today unanimously agreed with Robart's suspension of the ban. So first, we must thank Judge Robart and our three federal judge friends from today. But now, it's time to turn it over to the internet, who eviscerated Trump over his insane tweet. First up, we have Hillary Clinton, who issued perhaps the perfect tweet in response to Trump's "SEE YOU IN COURT!" So classy, so sassy. The perfect combo of restraint and incisiveness. And Clinton's response, which points out that not a single one of the judges who reviewed the ruling today was for reinstating it, was just one of many beautiful owns that the internet handed Trump today. Honestly, he deserves it. Nobody says "see you in court," without being in a bad 1990s comedy with giant cell phones and gets away with it. Not on our watch! So, without further ado, I give you the very best responses to Trump's attempt at a sick burn of the judicial process. trump: "SEE YOU IN COURT!" Donald Trump: "I'LL SEE YOU IN COURT!" Ninth Circuit: "We are a court." Trump "I'LL SEE YOU IN COURT"
Judge looks around "Um... I'm here everyday. It's kinda my thing really"
How do you take a court, to court? And does the court have home field advantage? SEE YOU IN COURT? I AM THE COURT! "See you in court" sounds like dialogue from a bad tennis movie. "See you in court. There'll be no love. Except for your score. Loser!" The POTUS yelling "I'LL SEE YOU IN COURT!" while already in a court is the type of thing no satirist would be clever enough to come up with. SEE YOU IN COURT, I SAID TO NOT TOUCH MY GAMECUBE GAMES AND NOW THEY'RE ALL IN THE WRONG CASES! Trump's SEE YOU IN COURT is like if Matt Ryan had gone home and tweeted SEE YOU AT THE SUPER BOWL. "See you in court" is kind of a strange response to one's defeats in two consecutive courts. "SEE YOU IN COURT" is what the rich white villain in a dance crew movie yells after he loses a rec room turf battle to a bunch of teens. "I'll see you in court" is not the thing people usually say after they lose in court. If someone said "SEE YOU IN COURT" in an episode of Law & Order, you'd be like, "This could have used another draft." I wonder who he thinks "SEE YOU IN COURT" is directed at. He has no idea what's going on. I will say this: "SEE YOU IN COURT" is legit the funniest thing a President of the United States has ever tweeted. Did he just say see you in court to a court?